Description: Although the "National Liberation museum" is about the liberation of The Netherlands during WWII, its focus is far more wide than 'just' that. The exhibition starts off with the rise to power of Hitler and National Socialism, dealing with the reasons of the success of the NSDAP and the events leading up to full scale war in Europe. After that, the course of the war and the characteristics of the countries involved are dealt with in a very clear and interesting way. Special attention is given to the dilemmas facing Dutch citizens in occupied Holland, via interactive displays. Visitors are confronted with the choices people had to make during the war. What would YOU do for example, when you were an underground resistance fighter and the Krauts (Germans) threaten to shoot several innocent people (including your best mate and his father) as a reprisal for one of your resistance-actions, if you don't give yourself up immediately? You know that if you do give yourself up, you'll face certain death or imprisonment in a concentration camp. Bloody great options to chose from eh?! After these pre-liberation themes, you'll see all about the main subject of the museum: operation Market Garden. Market Garden was the Allied attempt to capture the bridges over the great Dutch rivers Maas, Waal and Rhine via a combined airborne and land operation. If it would succeed it would have provided the Allies with a way around the massive German defence-line known as the West Wall and thus granting easy access straight into Germany. Although Market Garden's ultimate goal wasn't reached, it did liberate the southern part of The Netherlands. 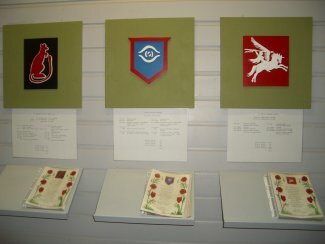 The museum shows all the events that took place during Market Garden on a large three-dimensional map. Apart from that it has several interesting displays dealing with the Waal crossing, the airborne tactics and the use of glider-material by the local population (see the photos below). The aftermath of Market Garden isn't forgotten either. The strikingly different fates of the liberated south and the occupied north are shown in various displays: while the south celebrated, the north faced the terrible Honger Winter (Winter of Hunger) during which a lot of Dutch citizens died of starvation. After you've seen all the exhibits you can visit the Dome of Honour, in which all the fallen Allied liberators of The Netherlands (and north-western Europe in general) are remembered. You can also have a stroll in the Canada-Netherlands Memorial Park right next to the museum (Canadian soldiers played a very great part in the liberation of The Netherlands). 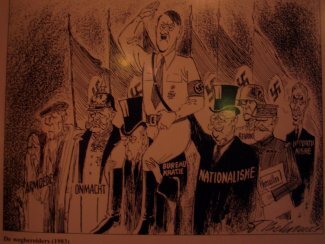 Striking cartoon dealing with the reasons why Hitler and National-socialism came to power in Germany. The people carrying Hitler forward represent poverty, bureaucracy, nationalism, the crippling regulations of the Versailles Treaty, opportunism, feelings of revenge, and the lack of action of the ruling class to steer Germany in the right direction. 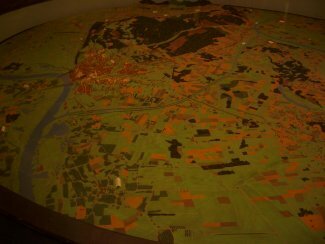 The large three-dimensional map on which the events of Market Garden are pointed out during an audio-visual presentation. Diorama of a so called "pathfinder". Pathfinders were dropped by parachute before the main landing party. 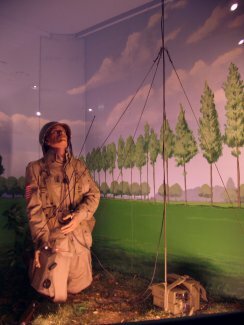 Their job was to set up positions (using radio, light and smoke signals) so that the right drop-point for the main airborne force could be determined. Pathfinders were used during Market Garden. 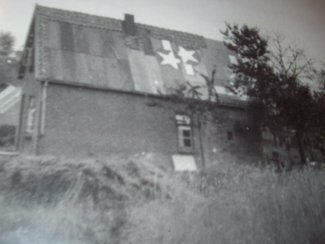 Material from the gliders that landed during Market Garden was used by the local population for several purposes. This picture displays a roof which was fixed with glider parts. Other forms of recycling included the use of glider wheels on farm carts and glider fuselage-tubes for artificial limbs for people unfortunate enough to tread on a mine. 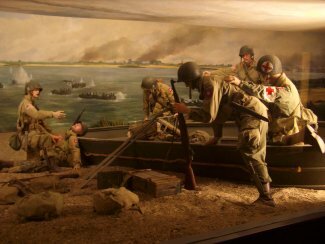 The museum's top display: a life-like diorama of the Waal crossing during which American soldiers crossed the Waal with little boats in broad daylight in order to capture the Nijmegen bridges. A lot of boats were turned over by German fire during this dare-devil enterprise. One of the real boats that was used during the Waal crossing. 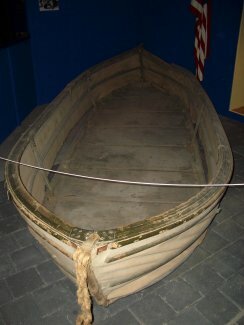 The boat consists of canvas and wood, and could carry about 12 men. It stood in a farmer's shed for over 50 years before it was donated to the museum. 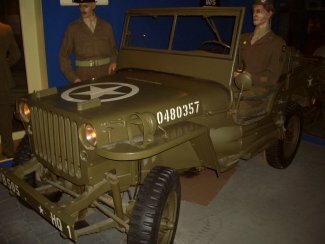 A good old-fashioned Yankee Jeep. 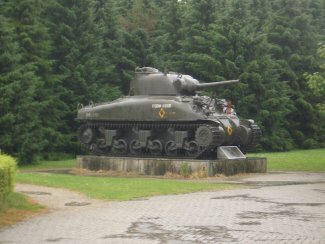 Sherman Tank on display outside the museum. 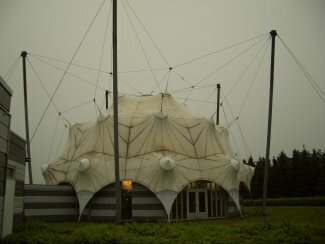 The Dome of Honour, built in the form of a parachute (a clear link to Market Garden), in which the fallen Allied soldiers are remembered. View from inside the Dome. The names of all Allied soldiers who fell between D-Day and the end of the war have been recorded in the Honour Roll, arranged by division.